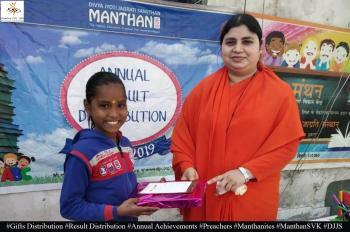 "Khabrein Abhi Tak" - the regional news channel based in Gurgaon, Haryana, celebrated Diwali festival with the beneficiaries of Manthan - Sampoorna Vikas Kendra (the education program of DJJS for underprivileged children). One hour Manthan- "Diwali special program" was aired on the day of Deepavali - 03 Nov 2013. Stationary and Notebooks were distributed to the children on the eve.